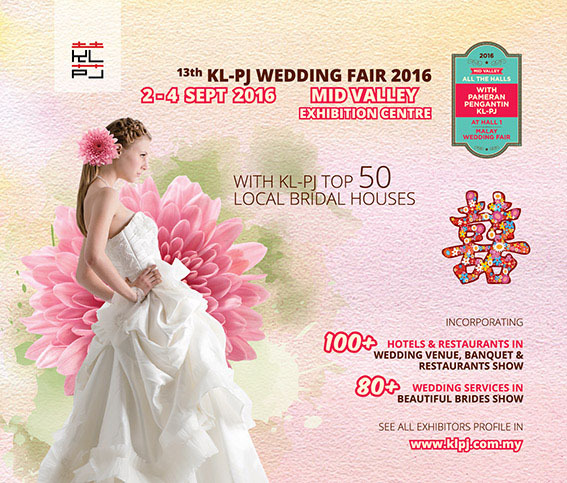 13th KL-PJ Wedding Fair 2016 on 2, 3 & 4 September 2016 at Mid Valley Exhibition Centre, Kuala Lumpur is the premier wedding expo in Malaysia. Also, the only exclusive wedding fair with KL-PJ Top 50 Local Bridal Houses, featuring 50 Bridal Houses / Bridal Shops from SS2, Sunway, Damansara, Puchong, Jalan Ipoh, Loke Yew and Cheras. This year, we are bringing you some of the top bridal house from Penang & Johor. KL-PJ Wedding Fair 2016 also incorporates more than 100 Hotels & Restaurants for your Wedding Dinner in KL, PJ, Penang, Malacca and Johor area. Plan your dream wedding within your budget or in the most luxurious 5-star hotel banquets. To add more excitement, "Fashion @ KL-PJ" will feature Malaysia's Best Wedding Suppliers - Wedding Gown, Wedding Dress, Wedding Shoes, Wedding Jewellery, Wedding Live Band, Wedding Planner, Wedding Decoration, Florists, Bridal Make-up, Photobooth, etc.